ALBANY, New York, February 2, 2012 (ENS) – The Nuclear Regulatory Commission sided with New York Attorney General Eric Schneiderman Wednesday, rejecting Entergy’s request for exemptions from critical fire safety requirements at the Indian Point nuclear power plant. The attorney general filed a petition with the federal agency last year over Indian Point’s continued failure to comply with federal fire safety regulations established to keep plants secure in an emergency. 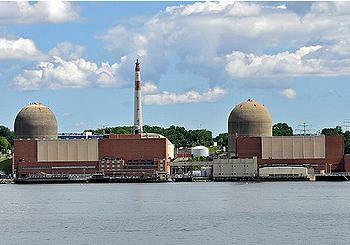 “In a major victory for the safety of millions of New Yorkers, the Nuclear Regulatory Commission agreed with our office and denied the great majority of Indian Point’s requests for more than 100 exemptions from critical safety requirements designed to ensure a safe shutdown of the reactors in the event of a fire,” said Schneiderman. Indian Point generates electricity with two reactors in Buchanan, New York on the Hudson River in heavily populated Westchester County about 35 miles from midtown Manhattan. Based on the information received in a March 6, 2009, exemption request from Entergy, the NRC staff has decided that most of the requests to substitute operator manual actions for fire protection features do not meet the agency’s safety criteria. For Indian Point Unit 2, the NRC is denying the use of operator manual actions for 24 of the 30 fire zones for which they were requested. At Unit 3, the agency is rejecting the use of operator manual actions for 18 of the 20 fire zones requested. Indian Point’s Unit 1 reactor was shut down decades ago. The company has implemented compensatory measures in these fire zones. They will remain in effect until the company completes its corrective actions, the NRC said. “After considering the compensatory measures, the NRC does not have an immediate safety concern,” said Michele Evans, director of operating reactor licensing in the NRC’s Office of Nuclear Reactor Regulation. In March 2011, Attorney General Schneiderman filed a petition with the NRC urging the agency to take enforcement action against the Indian Point nuclear power plant for its failure to comply with fire safety regulations. “Indian Point’s attempt to weaken safety precautions at the facility was wrong-headed and dangerous, and it is high time that this nuclear facility complied with long-standing federal fire safety regulations,” said Schneiderman. The NRC decision comes one day after a new government report revealed higher than expected earthquake risks in the central and eastern United States. The 1300-page report was released Tuesday by the NRC, the U.S. Department of Energy and the Electric Power Research Institute, a private non-profit organization representing the electric power industry. NRC states that the report, and its supporting files, are intended to be used to better assess earthquake risks at nuclear power plant sites. However, Schneiderman points out, in the report, NRC fails to provide information on when reassessment of earthquake risk at nuclear power plants would begin, when the work would be finished, or what plant owners would be required to do if reassessment indicates higher earthquake risk than a nuclear plant was designed to withstand when constructed decades ago. In view of this report, Schneiderman has renewed his call on the NRC to require that a full and transparent assessment of earthquake hazards at the Indian Point nuclear power plant is completed before relicensing. New York Governor Andrew Cuomo has called for Indian Point to be shut permanently, repeating a position he has taken ever since the September 11 terrorist attacks in 2001. The Nuclear Regulatory Commission has said it will accelerate a planned review of Indian Point and will allow state officials to take part in the inquiry.